Here's some news that should put a smile on the face of bicycle and pedestrian advocates. After years of delays, construction is underway on a long overdue multi-use path between downtown and Springfield. Here's a look at where it will go and at the work that has been done so far. The Hogans Creek Greenway is a City of Jacksonville Parks project that is a Florida Department of Transportation (FDOT) Local Agency Program (LAP) Design/Build project. The project includes three sections of a multi-use pathway from Market Street to Pearl Street. The path will be eight feet wide between Market and Newnan Streets, nine feet wide between Main and Laura Streets and twelve feet wide from Laura to Pearl Street. 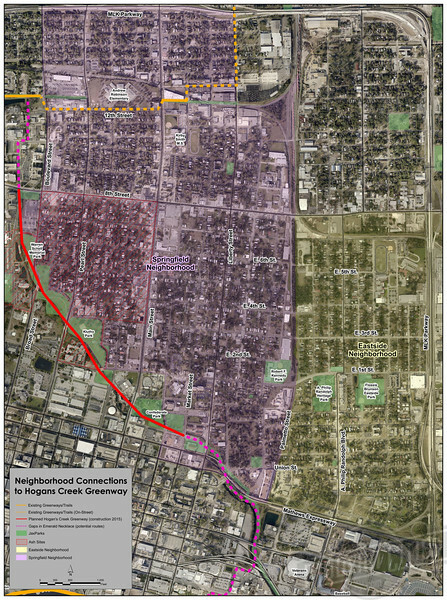 A future phase will extend the path to West 8th Street near UF Health Jacksonville. Potential future connections are being considered that could extend the path to the St. Johns River and S-Line Urban Greenway.